FAI board members declined to comment on the crisis that has enveloped Irish football as the association refused to confirm who will attend their Oireachtas Committee hearing next Wednesday. The Dáil panel have requested that ex-FAI CEO John Delaney is accompanied by senior board members for the session, but Abbotstown officials will not confirm their delegation. There is a strong expectation that president Donal Conway, legal & corporate affairs representative Páraic Treanor and honorary treasurer Eddie Murray will accept a request to join Delaney and interim CEO Rea Walshe. Conway, Delaney and several members of the FAI board were present at last night's draw in Dublin for May's European U-17 Championships, where Ireland will face Greece, Czech Republic and Belgium. Delaney spoke from the stage in his capacity as a UEFA board member after being welcomed as a special guest by Conway. But the pair stayed away from microphones and vice-president Noel Fitzroy and League of Ireland chair Eamon Naughton batted away media requests. "Good to see you ... I'm not commenting," said Fitzroy. Oireachtas Committee member Kevin O'Keeffe did accept the invitation to attend the draw but his counterparts were not present. 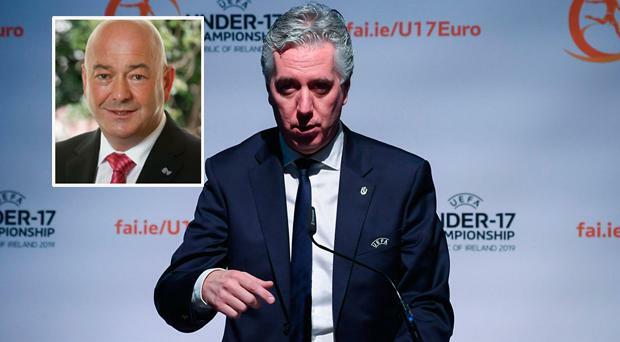 Meanwhile, A member of the Oireachtas committee which is due to question John Delaney and FAI representatives sat alongside members of the organisation's board last night as Mr Delaney addressed a Uefa youth finals draw.